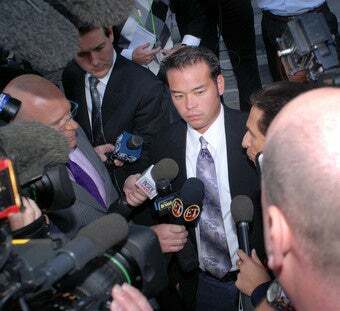 Radar Online has obtained the legal documents from Jon Gosselin's response to TLC's breach of contract lawsuit. The two documents were filed by lawyers Mark Heller and the unfortunately-named Christopher A. Hostage in Maryland, where Heller is not licensed to practice law. The first document reveals that when the Gosselins renegotiated their salary in April 2008, the network agreed to pay them $22,500 per half-hour episode of Jon and Kate Plus 8 and $45,000 per one hour episode. Jon claims that TLC still owes him $175,000. In Jon's answer to TLC's request for a preliminary injunction against him, his lawyers argue the original contract the Gosselins signed in 2005, is "unconscionable and therefore unenforceable" because the entire family was only paid $2,000 per episode and at the time "Mr. & Mrs. Gosselin... were unrepresented and unsophisticated." ... Might preclude the children from pursuing academic, athletic, or religious pursuits that may be scheduled in conflict with [TLC]'s filming schedule. Would not allow Mr. Gosselin or his family to take pictures at their home... thereby, Mr. Gosselin could not photograph or record his own family moments and hallmark events in his family's life. , which video footage depicts one of the children being denied water while pleading for same, during the staging and filming of [TLC]'s show. [TLC is a] huge, multinational corporate conglomerate... while Mr. Gosselin... is an unsophisticated father of eight children, who is also known as "David" in this instant lawsuit between "David and Goliath." Well, "unsophisticated" seems about right. The contract is quoted as saying the Gosselins can appear on news and talk shows on other networks as long as they coordinate their appearances with TLC's press department and are identified as being from Jon and Kate Plus 8. The document claims Mark Heller faxed information about Jon's appearances to TLC and its "press department's failure to do any 'coordinating' is not a breach by Mr. Gosselin." Mr. Gosselin will be unable to earn a living as a television personality, and therefore be precluded from supporting his eight children, whereas [TLC] currently has its show on "indefinite hiatus." Righteous, law-abiding, good citizens journey to seek the most coveted privileges of an American — which are equity, fairness, and justice, on the precondition that they reach out with clean hands to Honorable Justices and therefore, are worthy of the Court's consideration. However, here, [TLC]'s hands are so sullied, polluted and infected with wrong doing, deception, heavy handedness, unconscionability, and disregard for the Public's Interest, that the only resolve that justice should mandate is that [TLC]'s infected hands be amputated. As far as we know, judges can't sentence people to "hand amputation" in this country, but Jon's point stands: it's the unalienable right of every American to agree to put their family on a reality show, violate their contract, overrun the media with reports of their ridiculous behavior, and drag their problems through the American legal system.